Indexing the Search Server ensures that any files that have not (yet) been indexed are included in the index. Step 1. Access the Search Server Maintenance page. Step 1b. Click Search Server. The Search Server Maintenance page appears. Figure: The Search Server Maintenance page. 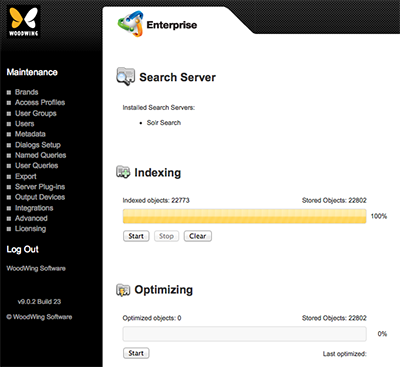 The progress bar in the Indexing section shows the percentage of indexed Enterprise objects for all Search Servers. When at 0%, indexing may never have been performed. Click Start to start the indexing process. Note: When the system contains thousands of objects, this could take a while; roughly 50 objects per second are processed, depending on various factors. When at for instance 95%, it could mean that one of the Search Servers has been down for a while, meaning that Enterprise has not indexed any new or changed objects. Note: When one Search Server is down, none get indexed. This is done to make sure that all servers stay in sync. First check if all Search Servers are running, and then click Start to complete the objects that have not been indexed yet. When indexing for one engine is successful and fails for the other, an object is marked as unindexed. When indexing these objects again, they will be re-indexed on the one engine, and added to the other engine. In other words: objects are only marked indexed when the process is successful for all engines.